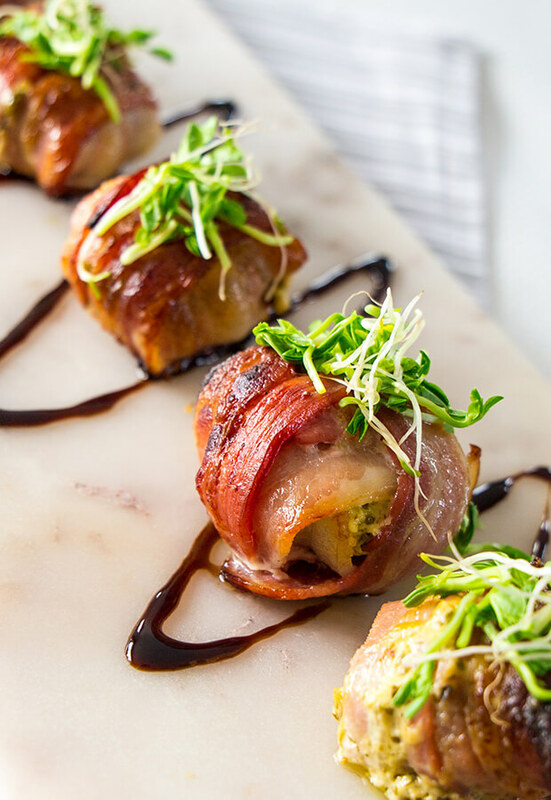 I know you’ll love these delicious, creamy, little low carb treats wrapped in bacon. 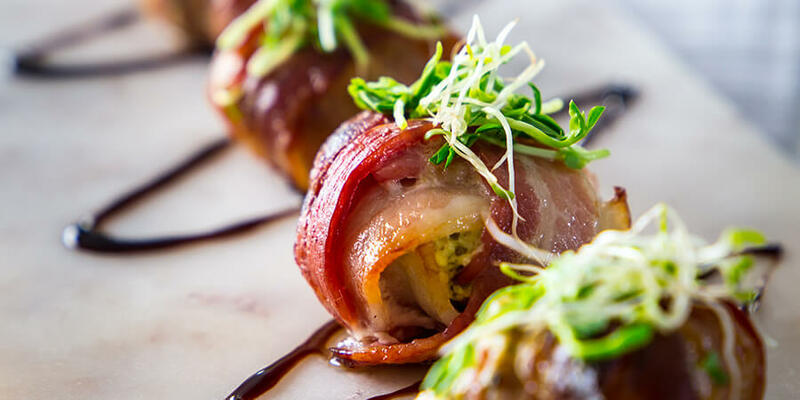 Creamy pesto stuffed mushrooms wrapped in streaky bacon were such a hit with the entire family. They are so simple to make, I just wish I had tried this earlier. With only 282 calories per serving, and 2.8 net carbs, these stuffed mushrooms can be used many ways. They are also relatively low in protein which is great for using as a quick lunch perhaps, especially if you want a bigger portion of protein at dinner time. They are fine cold or warm, sliced up in a salad. Another great meal idea is to add some kale to the oven to make kale chips with your stuffed mushrooms. Pretty much anything goes with crispy bacon! I often make these when I have guests coming over. No one would ever guess you were trying to give them keto food. It’s a sure winner I have used both for dinner and as party snacks. If you want to have them for dinner use 1.5 portions to boost the calories and quantity. When done the mushrooms should look like crispy little balls of bacon and will fill your house with all the best smells. They will be gooey inside with the pesto cream cheese mix. They only require 4 ingredients to make and they are 4 ingredients I most often have lying around in my fridge. There are no special ingredients or lengthy prep time needed. Perfect for a work night also. Try these with homemade pesto. 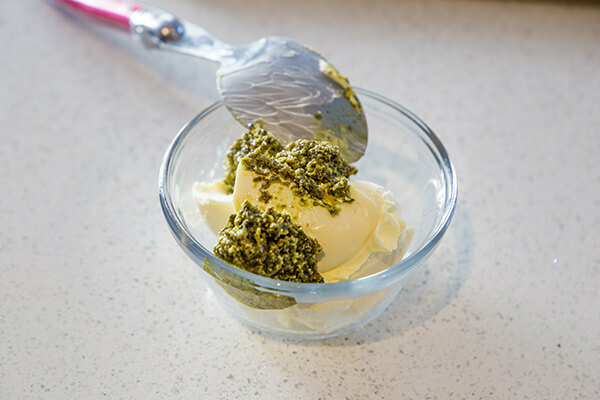 If you are feeling adventurous you can try out different ways of making pesto at home and use it in this recipe. I have even used a sundried tomato pesto before but that is slightly higher in carbs. 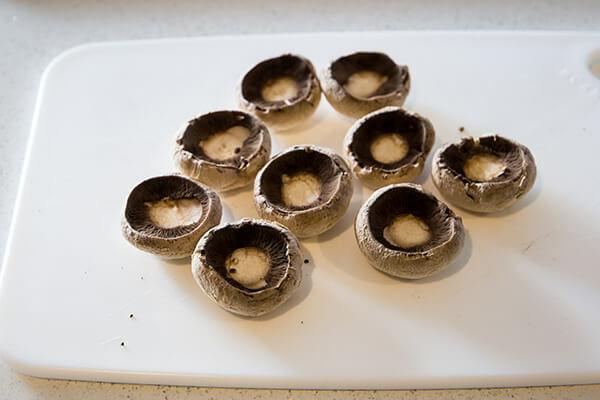 You can substitute the Swiss brown mushrooms with button mushrooms and the recipe will still work fine (you should not need to peel these.) I prefer the depth of flavor the Swiss mushrooms give. 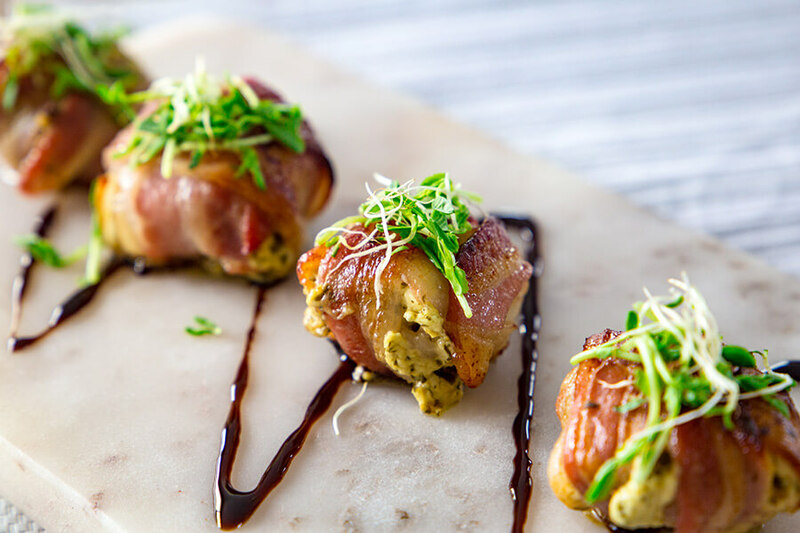 I like to serve with a little drizzle of reduced balsamic over the top and some micro greens. Bon Appetit! *You can make your own keto pesto or use store brought pesto. Either works fine. 1. Pre-heat oven to 375ºF degrees fan-forced. 2. Take the cream cheese and combine with your basil pesto of choice. 3. Lay streaky bacon slices on a chopping board and cut in half lengthwise. This allows you to wrap bacon both ways around the mushroom. 4. Take the mushrooms and peel and de-stalk them all. The stalks should remove easily if you gently pull them. 5. Where the stalk has been removed place a spoonful of the pesto, cream cheese mix into the mushroom. Repeat this process until the mushrooms have been filed. 6. Take one half slice of bacon and wrap it around the mushroom. Take the other half slice of streaky bacon and wrap around the mushroom in the opposite direction so the mushroom is nicely covered. Repeat for all mushrooms. 7. 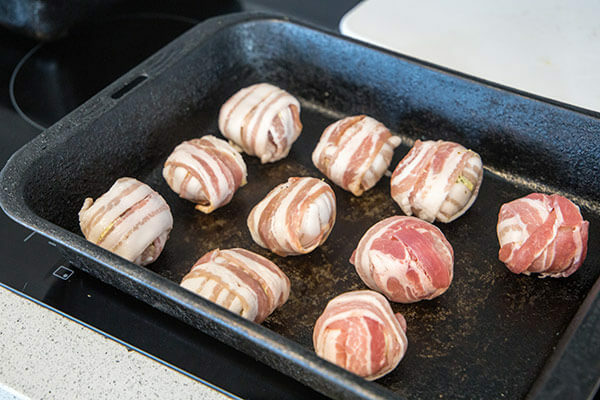 Place all mushrooms in an oven proof dish and place into the oven until the bacon looks a nice golden brown color and the bacon is crispy. This should take around 20-30 minutes depending on the size of your mushrooms. Keep an eye on the mushrooms as they shouldn’t take too much cooking if they are small. Larger mushrooms will take a little longer to cook down. This makes a total of 5 servings of Pesto Stuffed Mushrooms. Each serving comes out to be 409.6 Calories, 33.21g Fats, 2.8g Net Carbs, and 24.26g Protein. Pre-heat oven to 375ºF degrees fan-forced. Take the cream cheese and combine with your basil pesto of choice. 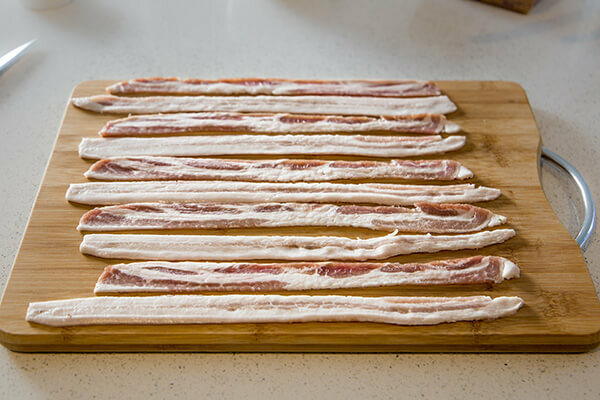 Lay streaky bacon slices on a chopping board and cut in half lengthwise. 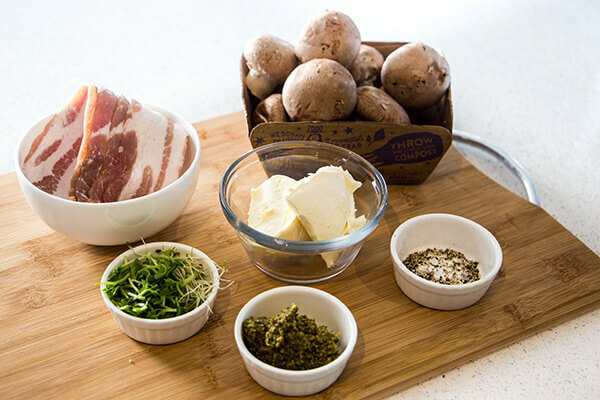 This allows you to wrap bacon both ways around the mushroom. Take the mushrooms and peel and de-stalk them all. The stalks should remove easily if you gently pull them. 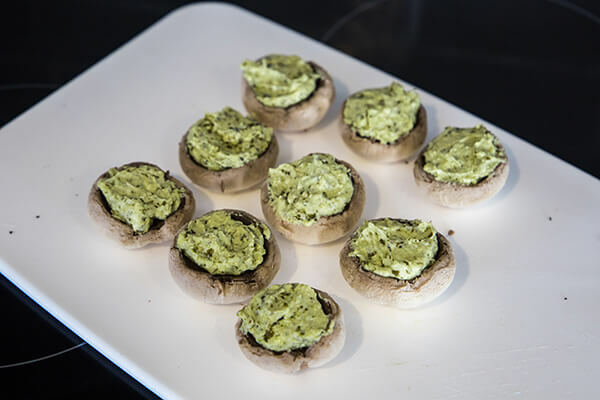 Where the stalk has been removed place a spoonful of the pesto, cream cheese mix into the mushroom. Repeat this process until all mushrooms have been filled. Take one half slice of bacon and wrap it around the mushroom. Take the other half slice of streaky bacon and wrap around the mushroom in the opposite direction so the mushroom is nicely covered. Repeat for all mushrooms. Place all mushrooms in an oven proof dish and place into the oven until the bacon looks a nice golden brown color and the bacon is crispy. This should take around 20-30 minutes depending on the size of your mushrooms. Keep an eye on the mushrooms as they shouldn’t take too much cooking if they are small. Larger mushrooms will take a little longer to cook down.